When you come to Southern Utah, one of the places you should definitely see is Zion National Park. It’s a quintessential example of our area’s unique form of beauty. Take in the majesty of towering sandstone cliffs, hike through the wilderness, and observe numerous kinds of flora and fauna when you visit for the day. Zion Jeep tours are one of the most exciting ways to explore the park. Cruise through the canyons with one of these three awesome companies, and see what all the talk is about for yourself! After you take one of these Zion Jeep tours through Zion National Park, you’ll probably be ready to experience even more of what gorgeous Southern Utah has to offer. 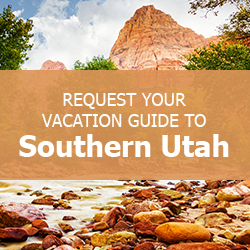 When you’re ready to explore more of our area, make sure you have a copy of our complimentary Southern Utah Vacation Guide. It contains great suggestions for great outdoor activities, restaurants, attractions, and all kinds of things to do in Brian Head, Panguitch, and Duck Creek. When you download the Vacation Guide, you’ll have everything you need to make memories that you and your loved ones will cherish for years to come. Check it out, and begin planning your ultimate Southern Utah family trip today! Zion Outback Safaris has been offering Zion Jeep tours since 2003. Their experienced guides can tell you all about the area in and around Zion, including the geology, wildlife, plant life, and human history of the location. In addition to standard morning and afternoon tours, they also offer private tours to any approved Zion location. For an aerial view, try their “Zion 360” Tour, which combines a backroad jeep tour with an amazing helicopter flight over the park. The Zion sunset tour is one of the most popular Zion Jeep tours at Zion Rock Guides. They also offer tours specific to West Zion, East Zion, and the high country. Zion Rock Guides’ excursions to some of the park’s hidden gems include scenic vistas, Native American rock art, hiking, and more! Zion Country Off-Road Tours offers both Zion Jeep tours and Zion ATV tours. The Jeep tours allow you to experience stunning views alongside guides who are deeply entrenched in the culture and history of the area. If you’re ready to cruise some more after the Zion tour is over, Zion Country Off-Road Tours also provides guided tours of the Southern desert. When you experience a Zion Jeep Tour, you’ll understand exactly why this area is such a cherished treasure. After a day exploring Zion National Park under sunny skies, enjoy an equally beautiful starry night at a Family Time Vacation Rental. Our gorgeous, spacious homes provide some of the best places to stay in Southern Utah! Filled with everything you need for a great trip, many Family Time Vacation Rentals are located in the Panguitch, Duck Creek, and Brian Head areas, giving you easy access to Zion National Park and plenty of other great attractions. Contact us today! We look forward to helping you make memories during your next family getaway!